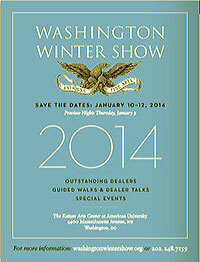 Today, I had the opportunity to check out the Washington Winter Antique Show with a close friend. We had so much fun looking at all the antique vendors (believe me, there are so many pretty antiques worth seeing there if you are in D.C. and have the time this weekend). The icing on the cake was a luncheon where the Lee Brothers talked about Charleston, South Carolina and all the low country style food we LOVE. 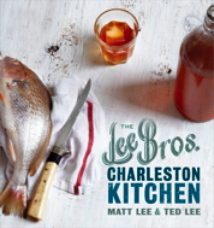 I haven’t been to Charleston in a few years, and hearing these two brothers talk about food and growing up in Charleston made me want to hightail it down there. 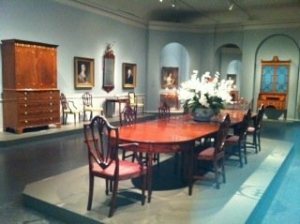 If you can’t make it to the antique show this weekend but love the history of furniture, please check out The National Gallery of Art and the Masters of American Furniture Exhibit. You will walk away with such an appreciation and knowledge of the furniture. Today was a dreary January day, and I needed some inspiration. 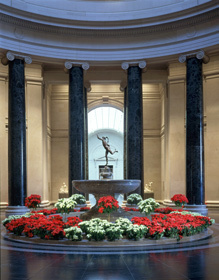 I did what I often do when I get the winter blahs: I headed straight to the National Gallery of Art. It’s one of the treasures of Washington, D.C. From the minute you step through security you feel a sense of appreciation for the museum and all the people who have contributed to it. 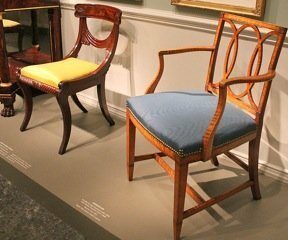 I headed to see one of the newer exhibits in the museum, Masterpieces of American Furniture from the 1700 to the 1830’s, which was donated by the Kaufman family. Seeing all that classic furniture was just what the doctor ordered, and I felt inspired right away. And yet as I looked at all the beautiful pieces, it struck me how over the years I’ve seen more and more cheap furniture imports coming into our country. I’m not sure what kind of hardwood or wood is being used under the veneers, but from experience I know it doesn’t hold up over time. Most often you will see cracks or chips in the veneer after a couple of years. Sometimes all of us want furniture strictly for convenience or for the short-term, and the inferior wood can work fine then. We all want at least some pieces that will last and that we can pass on. Hopefully, we will not lose the craftsmanship of making fine furniture altogether. There are still a handful of quality made furniture companies in the US. If you’re looking for a piece, take time to educate yourself before you buy. After a while you will spot the imported wood a mile away. The pieces in this exhibit will be here another 100 years but will our furniture be around? As I looked at the classic piece by Duncan Phyfe, who was a legendary American furniture maker, all I could wonder is what he would think about some of the imported wood being used today. He likely wouldn’t have used it even as a sawhorse. Here are a few pieces that caught my eyes with their carvings and inlays. The next time you need to freshen your spirits check out this exhibit. It’s a great lesson in understanding the different quality of wood in furniture, and a great history lesson. Thank you to the Kaufman family and the National Gallery for providing an inspirational day!